As a pet owner, the easiest way to show your pet how much you love them is to provide a balanced diet in healthy portions on a regularly timed schedule. More than likely, if your dog or cat is anything like Emma, there is really only one thing that may come before you in their life and that’s food. You often hear human dieticians and health professionals recommend eating 5 to 6 smaller meals each day, instead of 3 large ones. And the same is true for your pet, whether they could benefit from a little weight loss or simply need weight management. So, just be sure to be at home every two to three hours throughout the day to give your pet a healthy snack. Because you have time for that, right? I’m sure you’re already laughing. Who can be home every two to three hours during the day?! Someone, after all, has to hold down a steady job to pay the water bill and buy the food for the pets at home right? How on earth can you manage this feeding schedule and still work 8 hours, take the kids to soccer and ballet, feed your family, and get to the gym? Luckily, we have three quick tips that can make sure Fido and Felix’s meals are provided regardless of what else your days hold. 1. 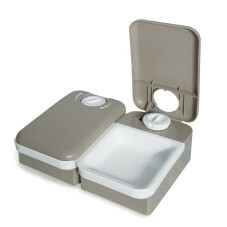 Consider incorporating a Drinkwell Fountain® into your pet’s lifestyle. Not only do the fountains provide a constant source of water, the pump systems also include charcoal filters that remove chlorine, odor, and small unwanted particles, like fur or food sediments. 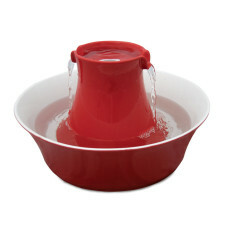 The water tastes better, and the movement of the water increases your pet’s natural instinct to drink more water. 2. Pre-measure your pet’s meals so you have one less step in feeding them. You don’t want to over feed your pet and lead them into obesity. Overweight dogs and cats face a number of health problems and can benefit from portion control. So, if you measure out your pet’s meals for the week on the weekend, you can quickly refill their food bowl on the go. 3. If you can’t get home in the day and find yourself increasingly busier in the evenings as well, a timed pet feeder may be exactly what you and your pet need. You can choose between the Two-Meal or Five-Meal versions. 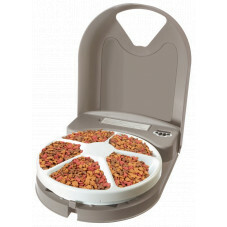 The Two-Meal Timed Pet Feeder can be programmed up to 48 hours in advance. And the Five-Meal Timed Pet Feeder gives your pet five one-cup snacks throughout the day. Which one works best for your pet? No one likes to be hungry and neither does your pet. As the weather heats up, hydration becomes more and more important as well. How do you juggle your pet’s schedule with your own? Do You Protect Your Pet from the Dangerous Spots in Your House & Yard?